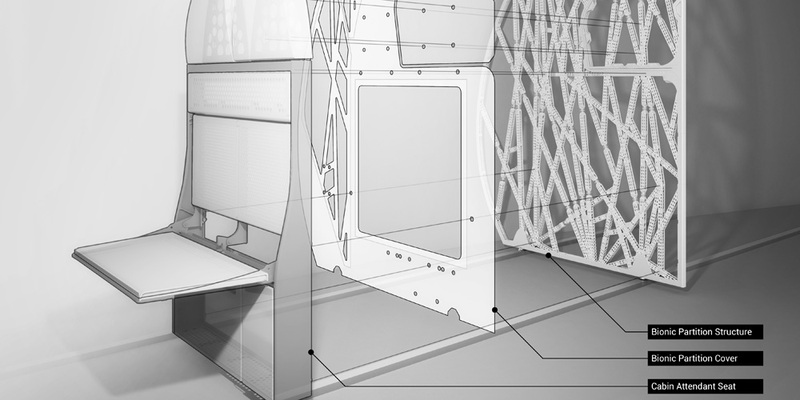 The Bionic Partition is the world’s largest metal 3D printed airplane component. The partition is a dividing wall between the seating area and galley of a plane, and it is a challenging component to design because it must include a cutout for emergency stretcher access and it must hold a fold-down seat for cabin attendants. The new Bionic Partition created through a pioneering combination of generative design, 3D printing, and advanced material is almost 50% lighter than current designs, and it is also stronger. This weight savings translates to fuel savings and carbon reduction. The final design illustrates a novel use of “bio computation,” and it demonstrates an ultra-high-performance result beyond typical engineering rules of thumb. The Bionic Partition is currently undergoing 16G crash testing as part of the process for certification and integration into the current fleet of A320 planes. When slime mold grows, it creates a complex 2D network that is both efficient and redundant. It is efficient because it connects a given set of dots (food) with a minimal amount of lines. And it is redundant because each dot touches at least two lines so if any line is removed, the dots remain connected in the network. We developed an algorithm that uses the “biological algorithm” of slime mold to link critical connection points in an airplane partition. Then we ran a process of bio computation that generates, evaluates, and evolves tens of thousands of design options. Combining our custom techniques of data science and bio computation, we can derive results that are both high performing and unexpected. The process is not about achieving cold-blooded efficiency. Rather it is about expanding our creativity. The Bionic Partition is pushing the limits of several technologies, but it is on track for a real industry application this year. When applied to all A320 planes on backorder, this new design approach could save up to one million metric tons of carbon emissions per year. Airbus, a division of Airbus Group, is the global leading commercial aircraft manufacturer with the most modern and efficient family of airliners. APWorks specializes in metallic 3D printing and covers the entire value chain, from optimized product design, to choice of materials, to qualified serial production. Autodesk helps people imagine, design and create a better world. The Living applies generative design, biology, and new materials to real built projects in the context of technology, culture, and the environment.